AzhwAr says that even if he wishes to move away from emperumAn, who is the protector of all, his senses will not leave emperumAn and praise anyone else. Just as emperumAn will not stop from protecting the worlds, AzhwAr’s senses will also not stop from praising emperumAn. Redeeming his senses from emperumAn is as difficult as making someone to get involved with emperumAn. kaN kANA, sevi kELA – eyes will not see; ears will not listen to. vAy avanai alladhu vAzhththAdhu – my mouth will not praise anyone other than emperumAn. Even if it is asked to praise others like the people of the world do, it would not do so. 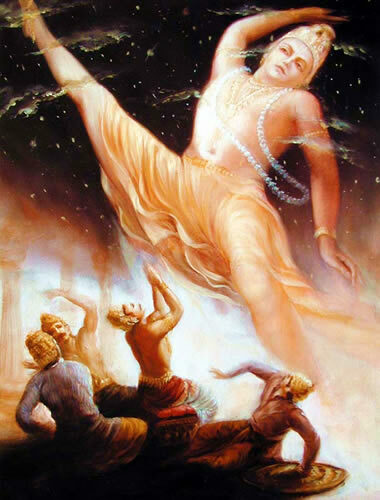 kai ulagam thAyavanai alladhu thAm thozhA – my hands will not worship anyone other than the entity who kept his divine feet on the heads of all the people in the world when he went about the task of measuring the worlds. He did this even when nobody asked him to keep his divine feet on their heads. Even when I prevent my hands from worshipping, they will worship him automatically, after seeing the simplicity of emperumAn. His divine feet are such that they will make the hands of those who do not worship him, to worship him! pEy mulai nanju UNAga uNdAn – the term pEy refers to pUthanA, the demon friend of kamsa. She came as if she could not live without giving him her milk. He [krishNa] also drank that milk as if he could not live if he had not consumed that milk. uruvodu pErallAl kANA kaN kELA sevi – my eyes will not see any form other than emperumAn’s; my ears will not listen to anyone’s name other than emperumAn’s. We shall take up the 12th pAsuram next. This entry was posted in Other on June 20, 2017 by T N Krishnan.